The arrival of instant browser play in the online poker world in recent times means online poker players now have more choice than ever when it comes to how and where they wish to play. And it all starts with the question: To download, or not to download? 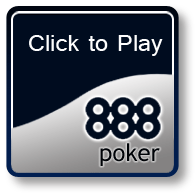 Ever since pioneering poker site 888 Poker launched its instant play version – which is largely regarded as the best no download form going around – thousands of Aussie poker enthusiasts have opted to create their 888 accounts in this quick and convenient way, without going down the traditional road of downloading the software onto their computer systems. But, just because instant play is rapidly increasing in popularity all around the world, it is not necessarily the right way to go for everyone. Below, we take a look at the benefits of both instant browser play and traditional software download. Note: PokerStars and Full Tilt Poker do not offer an option to play instantly via our browser – software downloads are required for both online poker rooms. 888 Poker promotes both options, so this article focuses on the benefits of the 888 Poker Web browser and software download platforms. The most obvious advantage of instant play over traditional software downloads is the fact you can log into your poker account from any location on any computer – 888’s no download version is compatible with Windows XP, Mac OS X or Linux – rather than needing to schedule your poker playing entirely around your down-time at home. The choice is yours; play in a library or Internet cafe, outdoors on your laptop or mobile, or at a friend’s house. Find out more about 888’s mobile poker application for Androids (play via a non-market app), Apple iOS devices (play via a Web app) and other smart devices such as Windows and BlackBerry phones. We all know how annoying it is to sit around and wait for the download/installation process of computer software to hurry up and finish, but with instant play you can be sitting at a table playing hands in next to no time, thanks to the ultra-quick speed of 888’s Flash version. No matter which computer system or device you’re using, instant play means more MB space on your hard drive, which eliminates putting any added strain on your system’s performance. The added fact 888’s no download version won’t interfere with the firewall or security settings on your computer, means you won’t experience any glitches that could otherwise be caused by the software download clashing with these settings. Note: 888’s software is free from spyware and malware and adware, so if you do choose to download the poker room, you should face no outside threats to your computer’s health. More Real Money Games Available: The main drawback with instant play is that players cannot access the full vast array of poker game types that the 888 Poker lobby has to offer. Instead, instant play needs to settle for a select sample of games, while those who choose the software download option get the benefit of a whole lot more variety. Access all of the New Features at 888 Poker: There is a wide range of innovative and exciting new features available at 888 poker, and unless you download the entire program onto your computer you will not get to experience these. 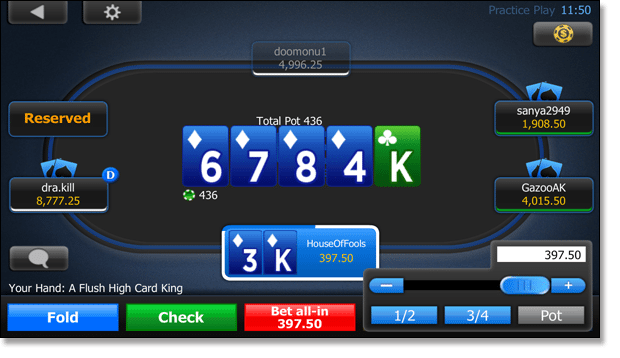 PokerCam tables – tables that allow you to view your opponents live during games via webcams – are proving very popular with 888 users, as is the new private games feature, which allows you to facilitate your very own poker game at your own private table with just you and whoever you choose to invite along to the game. Superior Graphics and Sound: Another bonus to downloading 888 Poker the old fashioned way is that – somewhat ironically – you get to experience better graphics and sound. 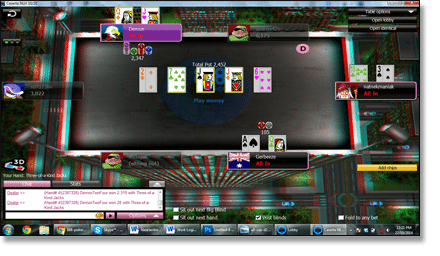 Standard graphics and sound at medium definition is used within the instant play interface, while those who opt to download the software will appreciate a much more eye-pleasing interface, not to mention the added aesthetic benefit of being able to play real money games at the new 3D poker tables, which – if you haven’t yet experienced – is certainly a worthwhile treat.